Queries are the main data processing component of any database systems. Queries work behind the scene shaping the data into Reports and other form of outputs. Microsoft Access Users (mostly beginners) attempt to create the output for a Report by chaining several Tables in Queries together and the report data is expected to form in one or two query steps. This approach may not be the correct one because it will be difficult to get the proper output for the Report. First, you must plan your Report by defining layout, contents, grouping, summary etc. If several related tables are involved in organizing the required data then you may take smaller steps of joining few tables or queries together in a Query. Use this Query as input and combine with other tables in the next step. You may create intermediate tables and crate Queries out of them for further processing of information. In these steps you may use Make-table, Append Table, Update etc. to process the data. When the Report contents are complicated and difficult to create then my approach is to create a Report table and bring the data piece by piece from the source Table(s) with Queries/VBA Routines and add or update them into the Report Table before opening the Report. These processing steps can be automated through Macros/VBA. Necessary report parameters like date-range or filtering criteria values will be collected in a parameter table to use them in data processing queries. There will be options in the Parameter Form either to Re-run the Report creation procedure with changed parameter values or to open the existing Report in Preview/Print mode. Here, we are trying to explore the usage of Sub-Queries in Queries to filter or incorporate data from tables or from other Queries. Let us look at a simple Query that uses a sub-query in the criteria section to filter data from the Orders Table. In the Orders Table there are about 830 Orders ranging OrderIDs from 10248 to 11077. We need to filter certain Group of Orders (say Order Numbers 10248,10254,10260,10263,10267,10272,10283) for review. 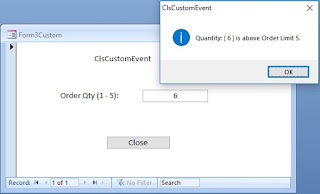 The above Query does the job but the problem is when we want a different set of Orders to be filtered then the Query's Criteria line needs to be modified physically to replace with new set of Order Numbers to filter. We can not expect the User to do this task manually, instead we must provide them with a facility to key-in the Order Numbers into a table (ParamTable with a single field: OrderNumber) and use it as criteria. This method will facilitate automatic detection of change of values in the table at run time. The User can simply type the Order Numbers on a Datasheet Form and click a Command Button to run the query with the changed order numbers. With this method we need a Sub-Query in the criteria row to compare the Order Numbers in the Paramtable with the Order Numbers in the Orders Table and filter data. We will modify the Query to insert a Sub-Query in the Criteria Row to pull the values from the ParamTable and to use the OrderNumber field values as criteria. The Sub-Query string in the Criteria Row is in Bold in the SQL above. It is likely that you already came across the above sub-query before, but we are going to learn how to use a Sub-Query as an expression in a Query Column to incorporate values from a different table, related to the Query Source Table. This usage is not so common and it is very useful at difficult times. When several tables are used in a Query with LEFT JOIN or RIGHT JOIN relationships it becomes difficult to link all the related tables this way to incorporate summary values of one table. This is more so when one-to-many relationships are involved. We will use Orders and Order Details Tables from the Northwind.mdb sample database for our example. Import both these tables from the Northwind.mdb sample database from C:\Program Files\Microsoft Office\Office11\Samples\Northwind.mdb. The sample Query (in normal style), given below, uses both the Tables in the Query, linked on OrderID Field of both tables to create an Order-wise Summary from the Order Details Table. There are several records in the Order Details Table for a single order in the Orders Table. Through the Sub-Query (Total Query) we sum-up the Sale Value of each Order and places the result in its corresponding row in the output. So, the Sub-Query runs in a separate Column as an expression independently for each row for the Orders table for the output. The new column name: OrderValue created can be part of other expressions and we have calculated the Tax value, 12% of OverValue, in a separate column. Let us take a closer look the Sub-Query. The SELECT clause uses only one output column (Sum((1-[Discount])*[UnitPrice]*[Quantity]) AS OrderValue) and the expression is named as OrderValue. You should not use more than one columns in the SELECT clause. In the FROM clause the Order Details Table is given a new name (ODetails) and this name is used to qualify the OrderID field in the WHERE clause. The OrderID field appears in both Orders and Order Details Tables. The WHERE clause in the Sub-Query is necessary to match the OrderIDs of both tables and place the calculated values in their matching row of Order Records.